Bringing school into the home was never an option in my mind. After all I grew up Homeschooled so my Mom had taken care of the step most Homeschool families take, setting up desks for school. That was Kindergarten, it didn’t take long until we realized school would happen in the dining room, living room couch or even outside. The desks became history in my family’s homeschool. I didn’t need to repeat whole desk thing for my littles. We got to start off with our Homeschool feeling like Home, not like school. It would never feel like school to my kids because I don’t even know what school is like! The importance of keeping our Homeschool space feeling like Home has always been close to my heart. When we finished our off our basement a few years ago, we planned to have one big playroom with a small corner dedicated to our homeschool space. The rest of it is a place for my kids to create, imagine, play and simply be at home. As I imagined what this space would be for our family I thought of the 80/20 rule. I wanted to keep our room about 80% Home and 20% school. Having a pleasant atmosphere in our home is extremely important to me as a Mom and that doesn’t stop when school starts. 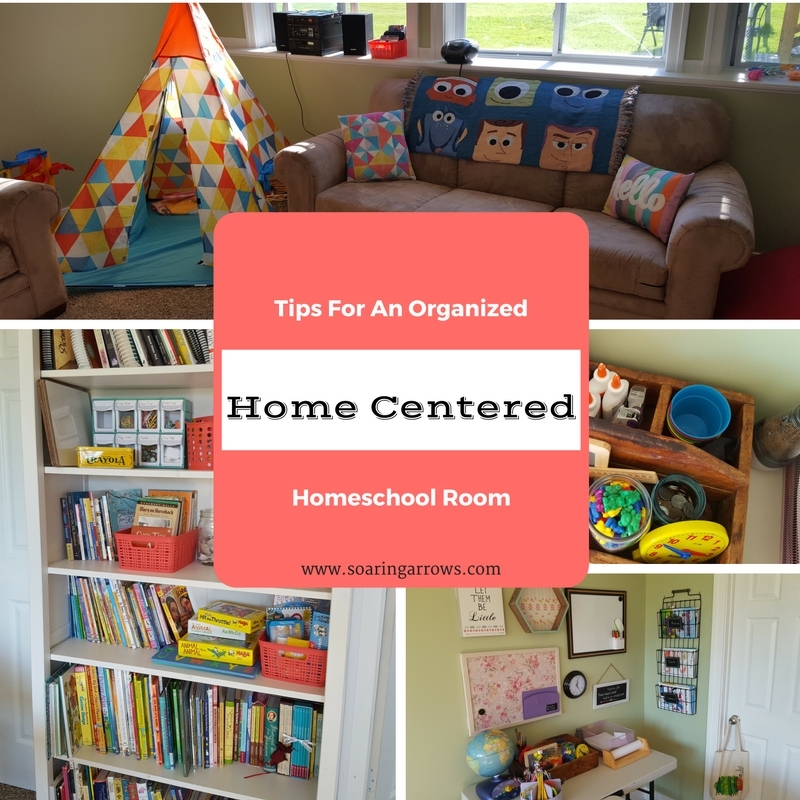 I still didn’t feel like I quite had this down before this school year so I added a few things to our homeschool space and worked more on organization than I had before. When things are organized it helps the whole flow of our day go better! 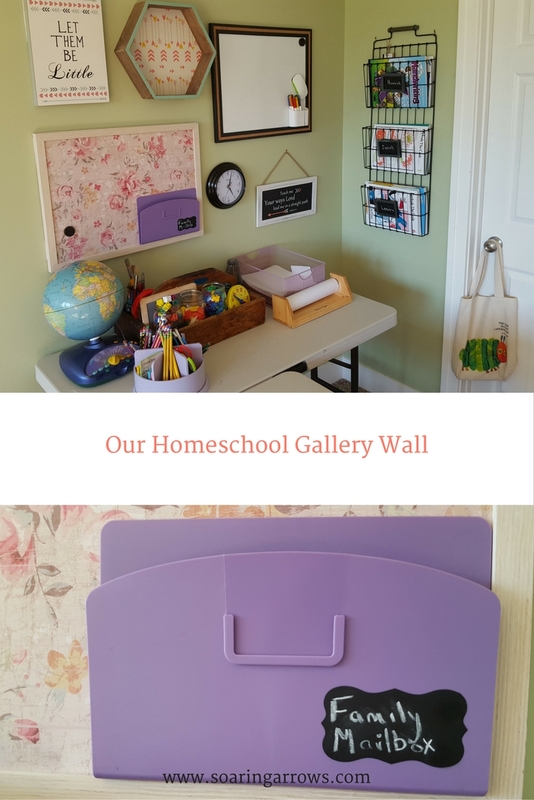 Here are a few things I thought of as I worked towards my goal for a space that would have the feeling of home, as well as the efficiency we needed for our homeschool. Part of my kids getting a hands on education is about having our art supplies, math manipulatives, letter magnets, mini magnetic dry erase boards, games and books within their reach. I leave a lot of this out on our school table so they have the ability to create & play freely. I used to ration paper, seriously I did! I have learned to loosen up about that, now I leave a basket on the table full of construction and plain white paper for my littles to use freely. There is no end to what they will come up with on their own, when I stay out of the way! These wildly creative moments only become a reality when they are able to create at the instant they imagine it. This could be cause for serious mess but as long as everything has a home, my kids are pretty good about putting each item back where it belongs, sometimes with reminders! I keep all our manipulatives as well as some art supplies in an old milk crate I found at an antique shop. Each separate manipulative has it’s home inside a Mason Jar. Games, Markers, Do A Dot’s and letter magnets are all sorted in baskets we keep on the bookshelf. Those are within my oldest childs reach so the Toddler doesn’t find them, who knows what he might do with his hands on those fun goodies! For the super tiny things, I store in tip out bins that hold paper clips, rubber bands, binder clips, and price tags for fun math activities. The best part is that it came with little labels for each drawer! Something new I did this year was I finally hung some pretty pictures and boards on the wall near our school space. Instead of overwhelming our school area with educational posters, I wanted what I chose to hang on our wall to serve a purpose but also bring a feeling of home to our school space. It could bring beauty, a strong scripture verse I needed to see every day, or serve our school space in a flexible way that will serve more than one purpose. I added a 3 part hanging basket to store workbooks in, which has already come in very handy. Last year I would find myself taking time to sort through books to find those small workbooks on the bookshelf each day. Organizing the workbooks by each child is going to be a game changer for me this year. I also added a “Family mailbox” to our school space this year! My kids are always writing each other special messages and notes, this has given them a place to put all their special letters to each other. It has also gotten me in the habit of writing notes to them. Just this week I sat down late at night and drew them each a picture with an encouraging note for them to open in the morning. The looks on their faces as they realized they each had a letter from Mom made their day as well as mine. As far as Art goes, we keep their Art in a special letter size cardboard box, one for each kid. Once they run out of room, it is time to get rid of something! Sad I know, but it is part of keeping our space clean and organized. This is by far the hardest to keep up on but also the best thing you can do to stay organized. Because our room is only 20% school that means the rest is basically 80% home and it’s the part of home that is their playroom, it can easily get out of hand! Sometimes it does too, but then inevitably it takes so much longer to get everything picked up. We are determined to keep up on picking up at the end of our school morning each day. Even 10 minutes of picking up makes a world of difference.This set up works well for us because I am homeschooling my three older kids but have a Toddler to keep busy while I am teaching. I’m so glad to have a space that allows Little Brave to play and listen to music while we do school. All of the toys are kept in wicker baskets with shelving from Ikea. The best investment we have made for organizing our space yet! When we are finished with school for the day, we make sure that any books left anywhere else in the house are put away. It’s like drawing a boundary line in our day that says, we are done with school and now our home is only our home. I can mentally shift gears to getting ready for my husband to get home from work as I make dinner. I make that move from Mom & Teacher to Mom & Wife, which isn’t always easy to do! But not having workbooks strewn throughout our house helps me make that transition. Four years ago we had no homeschool space, so I actually taught school in my daughters bedroom! That is what worked for us during that time. Each year we have switched things up according to whatever kind of school year we are going to have. Evaluate and consider what will work bests for your family. Maybe you have teenagers who really do their best work at a desk, by all means get that desk! Even if some of us crack the jokes about you being “that” homeschool family. Just laugh along and remember you are doing what works best for you and your kids. I tease about the desks now but in a few years I could be all about desks! So where did I find all these organizing goodies? Mason Jars – Amazon or your local grocery store! Resources – Just for you Mama to keep focused on your organizational or home atmosphere goals! 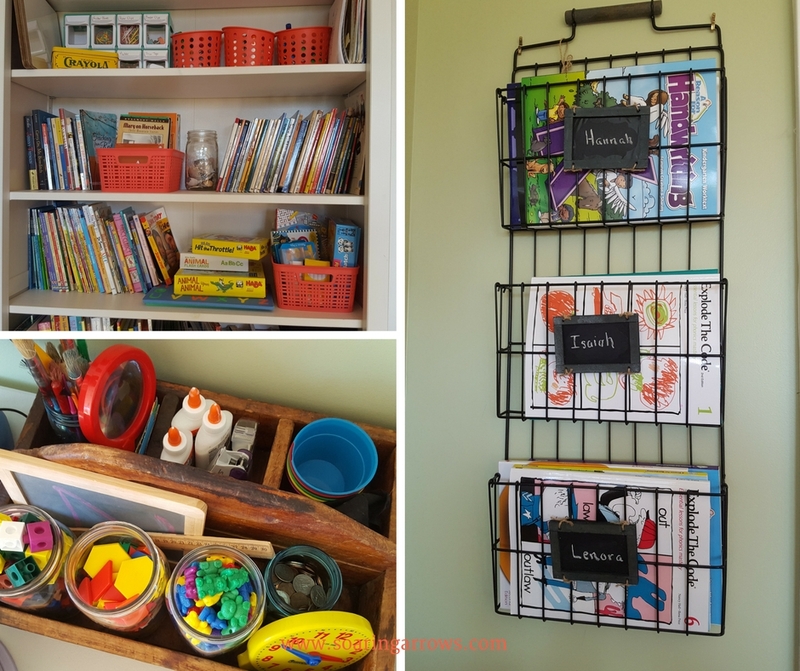 To see more incredible organization ideas head over to They Call Me Blessed for the 10 Days of Homeschool Organization blog party! Thank you! Last year we had nothing hanging up, it has been nice to have something lovely to look at! I love the family mailbox!!!! I’m thinking of adding that to our school room!